The holiday season has brought with it a new series of artwork at the Santa Maria Public Airport, with a lot of new pieces from local artists. 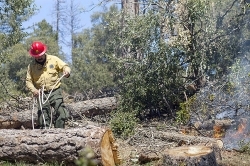 The show is curated by the Valley Art Gallery in Orcutt and features many of the nonprofit's members. One of the first things I was immediately impressed by was the sculpture work of Shamrock Acosta. (Look for his pieces in the glass case.) Acosta is doing a lot of fun things with found materials, especially vintage audio/radio equipment. Acosta's work has echoes of Isaac Asimov, an examination of a future world as envisioned by scientists 70 years ago. Every one of Acosta's pieces has its own sad and beautiful to story to tell–an attempt to create life out of the wreckage of human existence. These creatures seem to have molded themselves, desperately trying to piece together their own vision of humanity in an effort to survive human recklessness. I am excited to see more of Acosta's work and glad that it has such a prominent public arena for display. Marilyn Benson’s Juicy Fruit is a strong example of the artist’s mastery of Renaissance era techniques. Her painting is part of the current show at the Santa Maria Public Airport District. Another artist whose work stands out is Suzanne Rynders. Her After Glow, Morro Bay, an oil painting, is a nice departure from the traditional landscapes of the famed Morro Rock. Bathed in an eerie orange light, Rynders uses a strong palette of simple colors, experimenting with gradation and light in a whimsical and retro style. 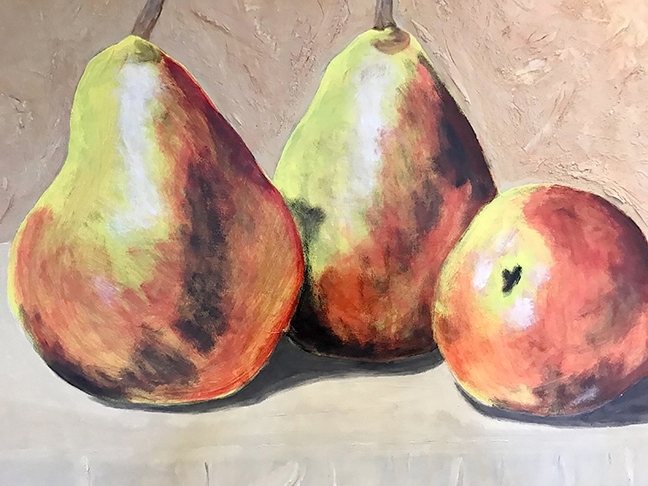 Marilyn Benson, one of my favorite local painters, is represented with a captivating still life entitled Juicy Fruit. Benson's work always has a hint of Renaissance technique and style, and the painting of the three pears is no exception. I love when artists focus on simple subject matter as a way to highlight their technique, and Benson is a master of this. The trio of pears presents an interesting dynamic in shape and how they each affect the lighting. Benson chooses to tell her story through light, creating dramatic shifts in tone and brush technique, playing off the elaborate juxtapositions in light and dark. It's a captivating piece that stands out, despite its humble subject matter. John Card's Zantedeschia is a good example of still life deconstruction. Zantedeschia is the scientific name for calla lillies, and Card captures the familiar white bloom in a bold way, choosing an extremely limited color palette and sharp determined lines to draw the reader through the space. 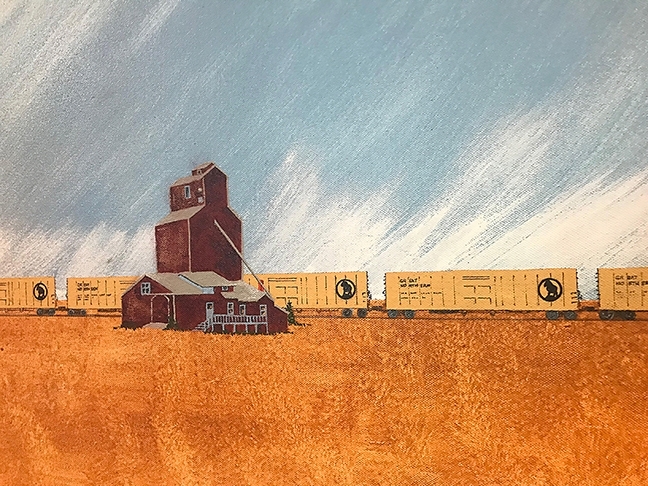 John Card’s elemental portrait of a grain elevator and train is one of many pieces currently on display at the Santa Maria Public Airport through Dec. 31. Card's work stuck out among the others for offering a bold look at nature, taking the organic into a more structured zone. Another one of Card's stunning pieces features a railroad on an isolated open field next to a red grain elevator. It's a remarkable use of composition and open space, telling a broader story with very few elements. Photographers are also represented, including Sharon Foster with her Coastal Fog II. Her photograph is utterly captivating for its scope and subject matter. Foster caught the coastline of Highway 1 just as a heavy blanket of fog rolled in. The contrast between the dusty cloud of fog and the swirling bright ocean beneath it is rather striking, complemented by the hints of wild fauna on the cliffs. Public art is an important element of any community, and Santa Maria's airport provides a needed access point to media created by artists from the community. Once again, the show demonstrates the eclectic nature of the creatives who make up the Santa Maria Valley and the unique ways they see the world around them. Arts and Lifestyle Writer Rebecca Rose is mostly made of trash. Contact her at rrose@santamariasun.com.